Silverline Office Equipment Ltd has been manufacturing steel office furniture in the UK for over 30 years. With a factory based in Mildenhall, Suffolk and a London showroom, the company now employs 110 people and turns over more than £10 million per year. 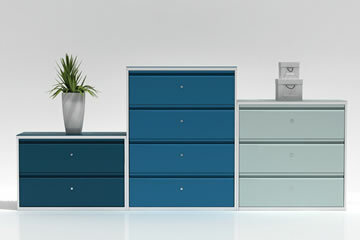 Its customisable product ranges have earned a reputation in the industry for high functionality, style and eye-catching use of colour. As a result, few customer orders are the same. In 2013, Silverline’s management team made the decision that a new platform and the associated financial investment were critical to the company’s market position and future success. They embarked on a year-long research and selection process for new “best fit” manufacturing software that would enable the company to achieve vital stepchange transformations in its business operations. The high volume of BOMs caused various difficulties in specifying new products and variations and made reflecting the manufacturing processes increasingly difficult and timeconsuming. Peter Murray, Systems and Manufacturing Development Manager at Silverline, explains: “The company had reached a stage where it had to think about manufacturing in a different context; as being a single process from quotation to invoice, not just about producing quality products to cost and delivering them on time. “It was crucial that we looked at new ways of working, getting orders swiftly and ‘right first time’ into our business software and then relay workflow information across departments very quickly. This would take us forward considerably,” Peter says. Competitive tenders from 3 vendors resulted in the selection of In2grate Business Solutions based on Microsoft Dynamics NAV and TRIMIT, a Microsoft Dynamics NAV partner with TRIMIT, a manufacturing solution tailored to the furniture industry. Previously, order documentation and labels were raised in advance and would have to be reproduced if the order changed during production. Now, documentation will be created at the time of requirement and routed to the appropriate physical location for use. Electrostatic paint booths within the manufacturing process have to be scheduled to apply colour from light to dark shades so that each colour is true and uncontaminated by its predecessor. This previously spreadsheet-based process will be automated within the new system, improving both efficiency and turnaround times and will integrate with Silverline’s Lean MRP Continuous Improvement programmes. One of the company’s initial expectations is to achieve a 50% reduction in order process times for customer specific orders. Configurator functionality within TRIMIT is capable of supporting the business and an expanding product portfolio for many years to come. Reduction in the number of Bills of Materials (BOMs) from thousands to less than 50 ‘master’ products. Dynamic cost calculations running alongside the BOMs, enabling automated, real time accurate customer quotations. New product ranges, product range extensions and variations can be defined and costed within hours. Reporting is in real time using a ‘single view’ of all data, eliminating the need for numerous complex supporting spreadsheets. Scheduling of the paint booths from light to dark colours is automated, facilitating Lean WIP flow rather than stock. Automated ‘pick, pack and ship’ means reduced despatch and delivery times with fewer errors using assured on-board scanning methodology. Customer specific product order processing timescales are expected to reduce by 50%.